While living in the Hampton Roads area of Virginia last year, I made a goal to discover some of their local and hidden gems. Two top kinds of places on my list included coffee shops and bookstores. No chain coffee shops or bookstore franchises; I wanted to go to someplace different, someplace unique. On one of my days off last Spring, I drove into downtown Norfolk and found a bookstore/cafe called Prince Books. While scanning through titles and authors on book spines, there was one that caught my attention at that time. I thought to myself, “this looks interesting” and skimmed through the synopsis on the back of the book. At the end of that bookcase, I found an armchair to sit in and read through a thick of the book until I realized my parking meter expired. Today is Holy Thursday. For Christians, the Lenten season has concluded and we have reached the culmination of the entire liturgical calendar, the Easter Triduum. We’ve also reached the culmination of this Holy Week. Since Palm Sunday we have been preparing for this. There are many different things I love about what each day of the Triduum offers for us in reflection. As I was on my way to St. Agnes this morning, I was reflecting on what’s to take place this evening at the Mass of the Lord’s Supper. My heart stirred with anticipation. The primary stirring in my heart was dining with Christ on this particular day, when the Eucharist was instituted during the Last Supper (along with the Priesthood, can’t forget that). I remember a few years ago listening to a CD in my car about the Eucharist and recalling Jesus saying: I have eagerly desired to eat this Passover with you… (Luke 22:15). I eagerly desire to eat this meal with you. The message of the story I read in Prince Books evokes God’s desire to dine with us, and this is a result of His unconditional love for us. Even in our unworthiness, He still desires the same. The gentleman who met with Jesus of Nazareth wasn’t a perfect, practicing Christian, but rather, a man who has lost his drive in life, his loss in faith, and his sense of purpose. Jesus saw this prolonging emptiness in his heart and sent him an invitation. 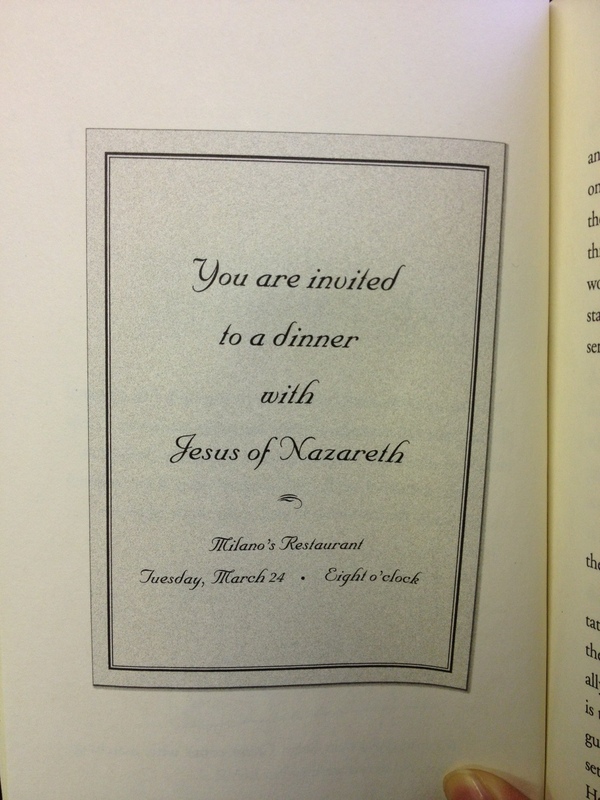 The man took Jesus up on this invitation and this conversation over the course of dinner changed his life forever. Though he doubted all of this at first, what’s important here was his openness in accepting the invitation. Jesus took care of the rest. Jesus invited all of them. He gave each of them the opportunity to dine with him because He eagerly desired it. He loved each of them, even Judas before he denied Jesus and totally separated himself from Him forever. Jesus gave Judas a chance to accept His love but it was denied. For us, God’s unconditional love is what keeps Him inviting us to be open to Him, to spend time with Him, and to freely give our hearts to Him with a love in return. This is what makes God a God of Love. He has the key to unlock our hearts, but He won’t open it unless we open it for Him first. He remains there, patiently waiting for us to respond and to allow our hearts to be opened to His great love. Stop closing yourself off because you feel unworthy. God loves you the same and always will, no matter how far you’ve run from Him. We, Catholics, believe that Christ is truly present in the Most Holy Eucharist. Body, Blood, Soul, and Divinity—He is present in the Eucharistic species. This complex mystery is the very reason why the greatest of meals (well, greatest of anything) we can ever participate in is the Holy Mass. What is greater than allowing Christ to be one with you through the reception of Himself? Nothing. Because He gives you everything. In Pope Francis’ first General Wednesday yesterday, he quoted Jesus in Matthew 8:20: “Foxes have dens and birds of the sky have nests, but the Son of Man has nowhere to rest His head.” Jesus did not have a home because His house is the people—that is, us. Will you make a home for Christ in your heart?